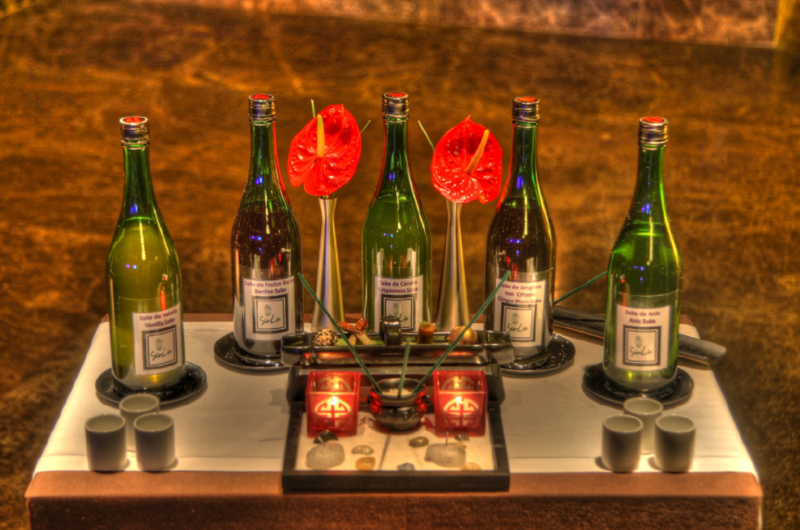 Grand Velas Riviera Maya recently unveiled a new Sake Menu at its Asian-inspired Sen Lin restaurant. The restaurant now offers both hot and cold sake – all made by hand from fermented rice. Flavors include cinnamon, vanilla, dried fruit, plum with ginger, the traditional anise as well as a creamy peanut and lemongrass. Lead by Chef Antonio Cortaza, Sen Lin is founded on the culinary traditions of northeast and southwest Asia including China, Japan, Korea, Vietnam, Malaysia, Cambodia and Thailand. Signature dishes include Kurobuta pork medallions stuffed with seasonal fruit, marinated duck in 10 spices served with warm plum sauce, seafood soup with spicy coconut, and warm lobster slices dipped in creamy Masago sauce. Sake is also the ideal accompaniment to a new selection of handmade Kogata No Kanki (petit fours), such as lychees filled with foam and gold leaf and Hazelnut truffle with ginger and coconut milk infusion with rice. guests at Grand Velas Riviera Maya.